The urban farm grows more than just produce for the Toronto university. food annually. Photo by Mark Blinch. 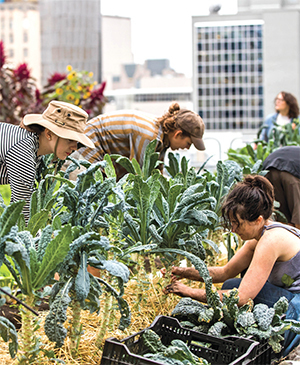 Ryerson is one of a handful of Canadian universities to have a rooftop farm. After a successful pilot project in 2013, students in the Centre for Studies in Food Security initiated the conversion of the building’s Andrew and Valerie Pringle Environmental Green Roof into a quarter-acre farm. “They worked with campus facilities to identify underutilized space that could be repurposed for food production and education,” said Ms. Throness, who gave a tour of the farm during a typical harvesting shift in late May. The harvested produce is sold at a farmer’s market on campus and distributed among Ryerson food services and 30 Community Supported Agriculture members. “We grow 10,000 pounds [4,500 kilograms] of food annually, and we collect data to see how much food we’re actually producing. That way, we can share our techniques with other people who want to replicate the project,” said fourth-year food and nutrition student Terri-Lyn Zhou, who is one of the farm’s two data coordinators. The farm is open to the public through short site tours, and offers a 10-week training program on food production, and workshops ranging from “probiotic dressings and dips” to “DIY mushroom cultivation.” The programs are another source of revenue for the farm, and private donors help to fill any gaps in the budget. The farm has grossed about $20,000 annually the past two years, Ms. Throness said. The goal this year is to double that.